Deathbat News | The Most Reliable Source For Avenged Sevenfold News Since 2007. Please check out the new AvengedSevenfold.com for a complete A7X experience and to check out the latest Avenged Sevenfold news! Thank you all for everything. VII: The End Of Deathbat News. After 7 years, it’s time for Deathbat News to come to an end. When I created this website I never imagined it would become what it did. The love and support from fans over the years has been incredible. Because of you, Deathbat News had a worldwide audience to spread the word about Avenged Sevenfold to and our community turned into a family. A family I will always be a part of. I can’t express my sincere thanks enough to you all. I truly cherish the friendships, memories and experiences that have come from this. 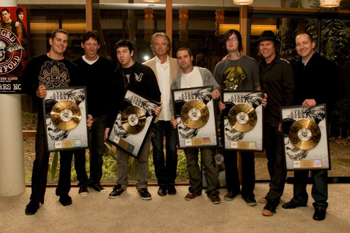 I also owe great thanks to M. Shadows, Zacky Vengeance, Synyster Gates, Johnny Christ, Jimmy “The Rev” Sullivan, Arin Ilejay, Larry Jacobson, Alex Reese, Kazy Brown, everyone on Avenged Sevenfold’s team at Warner Brothers Records, Mr and Mrs Sullivan, Diony, Marvin, Bruce, Za, Dave and the rest of Avenged Sevenfold’s tour crew, Jodi, Francis, Brian Haner Sr, Chris Epting and family, Cam Rackam, John Reese, John Oakes, Jessica, Danielle, Cheryl, Elizabeth, Brandon Geist and Revolver Magazine, Josh Bernstein at Alternative Press, Alexander Milas and Metal Hammer, Kerrang!, Hopeless Records, MTV, Active Rock Radio and everyone else who helped me and supported me over the years. Regarding the website: You will be able to access it using DeathbatNews.com for the foreseeable future. If that’s to change, you can use deathbatnews.wordpress.com. If needed, I can still be contacted at deathbatnews@gmail.com. After 7 years of being the number one source for Avenged Sevenfold news we are sad to let you know that the owner of Deathbatnews.com has decided to move on and no longer update the website. The person responsible for the website has never revealed her identity so we won’t do that here, but we truly want to thank her for her dedication and hard work over the years. In a world where websites and media make a living off of “click bait”, stirring the pot and misleading headlines, Deathbatnews was always run with facts and integrity. In the end, this played a big role in her deciding to close the site down. This website will be sorely missed as it was the number one source for band members and crew to become aware of news that we didn’t know about. “Deathbat Lady”, we will miss you and thank you for your years of dedication. Chris Epting’s “Rock ‘n’ Roll in Orange County: Music, Madness and Memories” will be released on November 18th and he shares that there’s “plenty” in it for Avenged Sevenfold fans. You can pre-order it now for $15.99 through Amazon. The great acts–from Hendrix to Joplin and from Kiss to Korn–played to the Orange County crowd at such classic venues as Huntington Beach’s Golden Bear, the Anaheim Convention Center and Anaheim’s Doll Hut. Rock ‘n’ roll’s OC roots include Leo Fender’s electric guitar factory in Fullerton and the birthplace for the garage–band standard “Louie Louie” in Anaheim. As the music changed, iconic OC groups like Social Distortion and Avenged Sevenfold helped lead the way. Final curtains came down here, too: though killed in England, Eddie Cochran is buried in Cypress, and Bobby Hatfield, half of the Righteous Brothers, is interred at Corona del Mar. Join pop culture expert Chris Epting for the essential big hits plus idiosyncratic flip–side riffs of Orange County’s mighty rock ‘n’ roll history. M. Shadows On Chris Jericho’s ‘Talk Is Jericho’ Podcast. M. Shadows was a guest on Chris Jericho‘s Talk Is Jericho podcast (14:55) to talk Hail To The King: Deathbat, its release, game merch, almost getting his legs crushed by Mike Portnoy on a jet-ski, ‘big things on the horizon’ and more. Avenged Sevenfold & Scuf Gaming Team Up For ‘Hail To The King: Deathbat’ Contest. Avenged Sevenfold has teamed up with Scuf Gaming for a ‘Hail To The King: Deathbat’ contest. Complete the actions here to be entered to win some awesome prizes. As a bonus entry, you can post a video of yourself on Youtube with the hashtag #dbgamespeedrun playing the ‘Nightmare’ level as quick as possible using only the Rusty Blade. The fastest few to do so will get the bonus entry. Submissions have to be uploaded by 11:59 PM (Pacific Time) on November 3, 2014. 1 winner will get an iPad pre-loaded with Hail To The King: Deathbat, 3 winners will get an Avenged Sevenfold Scuf Gaming Custom Controller and 20 winners will get Hail To The King: Deathbat game download codes. “Hail To The King: Deathbat” Discounted For Halloween + On Steam. Avenged Sevenfold’s “Hail To The King: Deathbat” has been discounted for Halloween and is now available for purchase on Steam. You can get the mobile game for only $1.99 on the App Store and Google Play. Music Industry Executive Craig Aaronson Passes Away. Craig Aaronson, the longtime music industry executive, has passed away. Craig played a large roll in Avenged Sevenfold’s signing to Warner Brothers Records in 2004. In a July 2004 interview Craig spoke of the signing, “I just signed a new group that’s on an independent label called Avenged Sevenfold. I’m doing that together with Andy Olyphant. We’re going to put out the record next year, but we’re really excited. They’re doing very well and are a good example of something that’s really been built up on the underground [level]. They’re on Hopeless Records right now, and we’re hoping to market that record a little bit with Hopeless. The record will sell over 100,000 records on an independent label, which is great for us.” Avenged Sevenfold have issued the following statement. My thoughts go out to Craig’s family, friends and all of those affected by his passing. It’s with great sadness in our hearts that we write this message to you all. An integral part of our A7X family has passed away. Craig Aaronson was one of the driving forces behind our decision to sign with Warner Brothers Records back in 2004 along with Tom Whalley and Andy Olyphant. We had heard horror stories about independent bands signing with major labels so when we first met Craig we were skeptical. We ended up trusting him and Warner Brothers Records and in the end we are glad that we did. Craig had not only been a personal friend to us through the years, but also helped spearhead many of the bands successes, including allowing us to have complete creative control throughout all of our albums. No matter what we handed into the label he would get behind it and go to work. Our manager Larry Jacobson has always said working with Craig was like working with a partner, always agreeable even when you disagreed, and because of that, A7X and WBR got so many good things done together. A couple of years ago Craig left Warner Brothers to do other things, we were saddened by his decision but realized he needed to move on. A few months later we were informed that Craig had been diagnosed with terminal brain cancer. While on chemo Craig still made it out to our Hail to the King album release show in Los Angeles earlier this year. We were all blown away by his dedication and will to live. Sadly, yesterday he lost the battle against cancer. He is survived by an amazing wife and kids. We will always be grateful to Craig and everything he has done for us. He has done the same for many other countless bands and without a doubt will be sorely missed. Thank you for everything Craig. P.S. Life is too short, spend some extra time with the ones you love today.